Note: TradeKing has recently merged with Ally.com; new managed portfolios are now being offered by Ally Invest. This review references products that may no longer be available. TradeKing Advisors offers professionally managed portfolios for investors as an alternative to self-directed investing. I can invest in one of the firm's Core Portfolios for 0.25% of assets under management (previously, Momentum Portfolios were offered at a higher rate but are not available for new investors). The benefit of a managed portfolio is that I can be invested in the stock market without the daily, weekly, and monthly hassles of monitoring activities and making buy or sell decisions. As a result, I can focus on earning and/or saving more, further improving my financial position. The disadvantage is that I could possibly enjoy greater returns and pay nothing in management fees (although I'd pay transaction fees to buy and sell most securities except commission-free ETFs and no-load, no-transaction fee mutual funds). Why would someone choose to invest in a managed portfolio with TradeKing Advisors or a similar service? 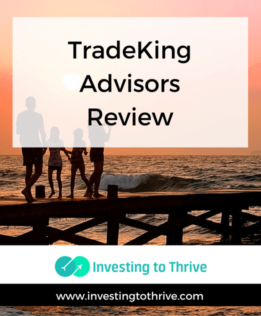 Dave Dusseault, COO of TradeKing, told me that many TradeKing clients have expressed 1) they didn't have the time to devote to self-managing their investments and/or 2) they thought they understood investing but their results have indicated otherwise. Further, the firm discovered via a survey that many people don't want to engage with financial advisors directly for fear of financial judgment but feel comfortable answering questions and making decisions online. As a result, TradeKing decided to develop, present, and sell professional managed investment portfolios online to better service its clients. Because TradeKing's expertise is in offering low-cost discount brokerage services with great customer service, the firm turned to Ibbotson Associates for the design, development, and management of its investment portfolios. Ibbotson Associates is a registered investment advisor and Morningstar company that provides asset allocation, manager selection, and portfolio construction services primarily to institutional investors. The Core Portfolios and Momentum Portfolios associated with TradeKing Advisors were introduced in May 2014 (though Ibbotson has a 35-year track record). The Momentum Portfolios and an add-on feature to the Core Portfolios (RiskAssist) are no longer being offered to new clients as of December 2016. As TradeKing is continually looking for ways to improve the customer experience, so changes may be made in how information is presented in the coming months, including information on each portfolio's performance (the number one question potential clients ask about the portfolios). For example, the minimum balance to establish a Core Portfolio account has dropped from $5,000 to $500. The Core Portfolio minimum is $500. When TradeKing Advisors introduced its managed portfolios, the account minimum was $5,000. Later, this number was dropped to $500, which is likely more manageable for a greater number of people.From what I can tell, I could open an account and begin to accumulate funds with a balance of less than $500. But my money won't be invested in a Core Portfolio until my balance reaches $500. The Core Portfolio represents broad, diversified holdings of the global market. I think of the core portfolio as a diversified portfolio with a more classic asset allocation; and the momentum product as one that had an asset allocation more heavily favoring high-performing asset classes and sectors.Momentum investing can mean buying asset classes and sectors when they are increasing in value, possibly delivering better than average returns. But it can also mean buying investments when they have peaked in value, potentially resulting in greater losses. There are five versions of the Core Portfolio. Various types of core portfolios are available, with weightings of asset classes tweaked according to an individual's needs. A version is recommended based on responses to several questions pertaining to time horizon and risk tolerance. There's an assets under management (AUM) fee of 0.25% for the Core Portfolio (or $1 per month if an account has less than $5,000). Generally, there's an annual fee (billed monthly) based on the assets under management (the portfolio balance) unless there's less than $5,000 in the account. For example, there's a $25 annual fee for a $10,000 core portfolio.The AUM fee and small monthly fee for accounts below $5,000 are the only fees paid directly. There aren't transaction fees on trades made in an account, unlike more traditional investment firms that often pass along trading fees. Money is invested in ETFs and ETNs. The investment portfolios offered by TradeKing Advisors consist of exchange-trade funds (ETFs) and exchange-traded notes (ETNs). Prospective clients can get an idea of how money will be invested by reading about the portfolios. After investing, clients can view details about holdings, including percentage weights compared to the entire portfolio and performance. These portfolios are updated to assure that the proper asset allocation is maintained. Portfolios may even be updated or re-balanced on a daily basis depending on market movements. Fortunately, there is no direct cost to the investor for these frequent trades. However, if the portfolio is held in a regular account, then there may be taxes on capital gains that occur because of these frequent trades. Portfolios can be held within a retirement-account classification, such as a traditional IRA or Roth IRA. Investors can choose to hold one of these portfolios within a retirement account. By using a tax-advantaged account, clients may be able to avoid paying taxes on earnings prior to taking distributions in retirement. In addition to the standard features of these managed portfolios, there is a unique add-on service for the Core Portfolio: Risk Assist. Investors pay 0.50% of AUM for this service, which involves reallocating equity assets toward fixed income assets during steep market declines (generally, stock funds are sold and bond funds are purchased). Note that this service is no longer being offered to new investors. This service was accessible for sign-up from the TradeKing Advisors dashboard. TradeKing Advisor clients who have this feature may not have seen Risk Assist in action as this feature is activated in more severe environments such as the recessions of 2001 and 2008. Those who are skittish about investing or want more stability during withdrawals may find this feature valuable. I tend to let markets (and my investment valuations) rock and roll (and have learned to keep extra cash on hand for market dips) but Risk Assist may have been a good add-on for some investors. Finally, to learn about the research and methodology behind the construction and management of the Core and Momentum Portfolios, you can read this whitepaper on the Ibbotson Asset Allocation Methodology published by TradeKing Advisors.